5 songs seperate on the b-side. Ghanaian highlife at it’s best. Read backsleeve for more details, it’s in the file. Cheers folks. This entry was posted in Ghana, Highlife by Moos. Bookmark the permalink. The music is fantastic! I’ve been wanting to hear this one (Alex Konadu’s first album) for quite some time. Thank you! Wow! What an amazing band! It’s records like these that make my birthday come early every day! THANK YOU SO MUCH FOR POSTING THIS UNBELIEVABLY POWERFUL AND BEAUTIFUL RECORD. Admittedly, I wasn’t expecting much when I downloaded the rip, but a few minutes after I took the tunes outside and into the bluff behind my house I was BLOWN AWAY! Ghana is on the map for me now, more than even my beloved Ali Toure of Mali. If you have any more LPs like Alex, please post! It was indeed very sad to hear of Mr. Konadu’s passing. I have a good 20 LP’s from him and have seen many more! So it’s a treat to come across this here album for the first time. I’m excited to hear it. Great cover too. This one is a real treat for the Highlifer’s. Thanks! 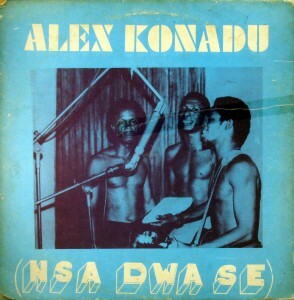 Oh snap, I just realized that I actually own this LP but it’s titled Kunadu’s Guitar Band. Far out. This is his best album.